Lord God Almighty, in whose Name the founders of this country won liberty for themselves and for us, and lit the torch of freedom for nations then unborn: Grant, we beseech thee, that we and all the peoples of this land may have grace to maintain these liberties in righteousness and peace; through Jesus Christ our Lord, who liveth and reigneth with thee and the Holy Spirit, one God, for ever and ever. Lord God Almighty, in whose Name the founders of this country won liberty for themselves and for us, and lit the torch of freedom for nations then unborn: Grant, we pray, that we and all the peoples of this land may have grace to maintain these liberties in righteousness and peace; through Jesus Christ our Lord, who lives and reigns with you and the Holy Spirit, one God, for ever and ever. On 2 July 1776, the Continental Congress, comprising delegates sent by the legislatures of the thirteen colonies, voted to declare complete independence from British rule, and on 4 July the formal wording of the declaration (principally the work of Thomas Jefferson) was approved and the document signed. That whenever any Form of Government becomes destructive of these ends, it is the Right of the People to alter or abolish it, and to institute new Government, laying its foundation upon such principles and organizing its powers in such form, as to them shall seem most likely to effect their Safety and Happiness. The decision to seek independence rather than simply a restoration of the colonists' traditional rights as British subjects did not come readily or suddenly. Armies had been in the field for more than a year before the Declaration, and for another two years afterward, the officers of the Continental Army drank his Majesty's health at every mess. 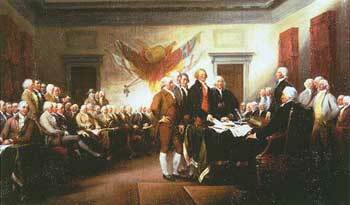 But the Declaration was rightly acknowledged as crucial. It speaks in terms of the Natural Law and God-given principles of justice and right, in language that, as one (British) writer has said, combines great prose, great politics, and great theology.